The best summer dinners, in my opinion, are those you can make ahead, include fresh veggies and are adequately filling, this dish meets the criteria and is worth the small bit of effort required. I discovered this recipe at this hip little blogspot (courtesy of Pinterest) and hope you'll give it a go! Prepare 8 oz. of noodles, udon, egg, wheat spaghetti/linguine anything really, although udon or soba are recommended. 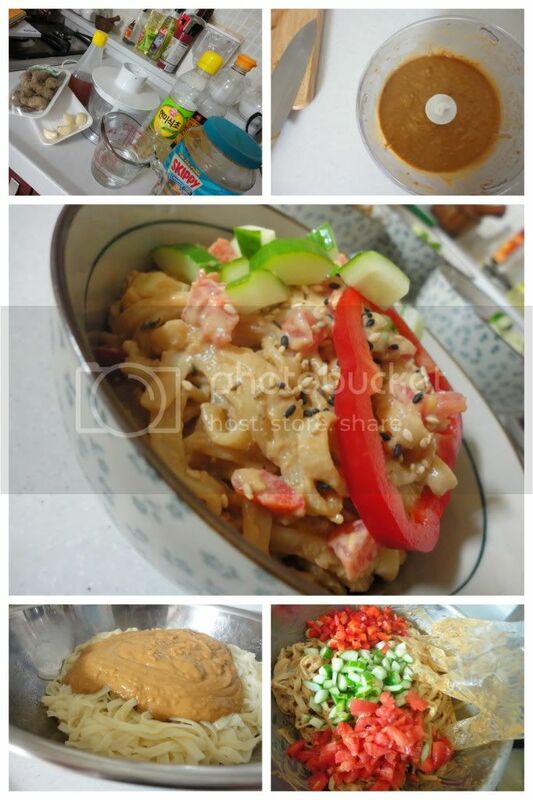 In a food processor mix together: 1/2 cup Creamy Peanut Butter, 1/2 cup Warm Water, 1/4 cup Soy Sauce, 1 Tbsp. minced Ginger, 4 Garlic Cloves, 1 Tbsp. Honey and a dash of Rice Vinegar. Use a gloved hand to mix the noodles with sauce and your choice of fresh veg - I went with cucumber, red bell and tomato and was more than satisfied. Sprinkle some black and/or white sesame seeds on top and you've got the perfect summer snack or light dinner!